February 21, 2018 February 19, 2018 / J.K. 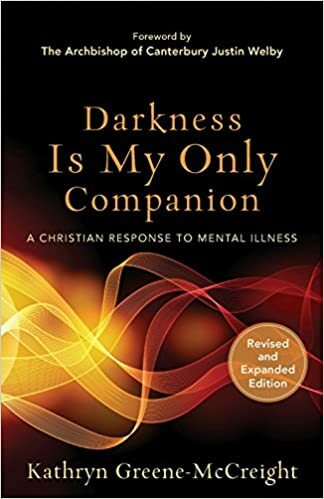 The best summary of this book comes from the subtitle – A Christian Response to Mental Illness. However, even that is quite all encompassing enough, the book is part autobiography, part pastoral guidance, and part education on what mental health can actually look like. Greene-McCreight’s insights do not come from counseling or academic study of psychology, but her own struggles and personal mental health issues. Because of this, you’ll get invaluable insights into a first hand account of mental health problems, but not a great deal of help in understanding how to respond or counsel people. She breaks the book into three sections, first, what she calls ‘facing mental illness’, which is her personal story; second ‘faith and mental illness’, which is still mostly her personal story, but with a focus of how mental illness interacted with roll in the church; third, ‘living with mental illness’ which has two chapters, ‘how clergy, friends, and family can help’, which sadly is only seven pages, and ‘choosing therapy’, in which she discusses the churches fears and rejection of psychotherapy. The book finishes with her conclusion and two appendices, one on her use of scripture and a checklist for symptoms and resources. She says she is using NRSV, but nothing I found online matched (I’ve linked the NIV). It must be an older translation, I do not know if it is closer to the original Hebrew or not, but her translation certainly captures the feeling of depression and despair that one feels while struggling with mental illness. I wanted to like this book more than I did. I appreciate and have immense respect for her honesty and candor in this book. I was blown away by her personal story. The book is fairly educational, she goes into different medications (as in the levels and types from a pharmacology standpoint), and discuses her experience with Electroconvulsive Therapy, which you might know as ‘shock’ therapy. Where the book falls short is anything outside of her. It doesn’t appear she has counseled people with mental illness, and as mentioned above, the outside response is only seven pages. I was somewhat annoyed by one of her chapters regarding faith centered around her ordination and her IQ test, that while her score was well above average, she felt didn’t reflect her due to her struggles with depression. I think this partly comes from the Mainline denomination and their clergy’s obsession with where they were educated. She tells us multi times throughout the book that she attended Yale. I support the requirement that pastors be seminary educated, and I think Evangelicals have gone too far with the, ‘we don’t need no education’ stance, but Mainliners have a tendency to view pastoral education too academically, and her book suffers from this. Greene-McCreight gives us many great quotes from philosophers and Christian’s from the past, but there is very little in the way of pastoral counseling or response to mental illness from those not suffering. I find the especially odd coming from the Mainline, that doesn’t suffer the same strength of rejection to counseling and psychotherapy that Evangelicals do. One final note to any Evangelical considering reading this book, don’t be turned away because the author is a ‘liberal Christian’, for the most part she holds to a very conservative view of Scriptures. Maybe not seeing outside of her liberal, academic viewpoint, she opens the book defending her use of the Trinitarian view of ‘Father, Son..’, over and against the feminist view that calls for inclusive language for God. For Evangelicals whom haven’t read much outside of their own viewpoint, this can seem strange. For anyone wanting to pass on this book because you don’t believe in female ordination, relax. This book is about her deep struggle with mental illness and anyone who is interested in what the looks like, who hasn’t experienced themselves, I’m not sure you’ll find a more open and honest book. The book falls flat in a few ways, but if you looking for something to learn from a personal story of mental illness, this book is for you.